JLL announced it has sold The Shops at Lexington Circle on behalf of Mirabeland Investments and Concordia Properties. 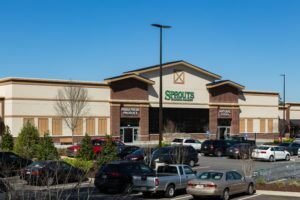 The 43,199-square-foot open-air shopping center is located in Peachtree City, a suburb of Atlanta and is anchored by Sprouts Farmer’s Market. Coral Gables-based Riverstone Capital Group purchased the asset. “As a newly developed shopping center with an exciting grocery anchor, The Shops at Lexington Circle garnered significant interest from the investment community,” said Caldwell. The Shoppes at Lexington Circle is located along West Highway 54, the primary retail corridor in Peachtree City. Peachtree City is an award-winning master planned community located just south of Atlanta. The area economy is thriving with many residents working for corporations locally and others commuting to Atlanta. Continued growth is expected for the area with the recent opening of Pinewood Studios, the biggest purpose-built studio complex outside of Los Angeles, located about five miles from The Shops at Lexington Circle.